Little Mrs. Married: Yummy! Taco Salad! Last night, i made Taco Salad. It was delicious. I mean, DELICIOUS!!! I think you want the recipe (or you should)! Today's leftovers are even better!! I have to say, though, that if i had it to do over again- & i'm sure i will at some point!- i would put the salad dressing in GRADUALLY. Not just measure & pour. Of course you already knew that. I mean, it's logical. But i've only been cooking for a short time & sometimes forget that i can experiment & do not have to follow the recipe 100%! :) Anyway, it was still very good! But i do think the dressing was a bit too much. I also think it'd be okay to not put in dressing at all & just add it to the individual serving. I don't know. Just some thoughts. But it was really tasty!! :) & feeds an ARMY, so plenty of leftovers! 1 jar (11 ounces) salsa (my jar was 16 ounces & i used the whole thing). In a dutch oven over medium heat, cook the beef with 1 envelope plus 2 tablespoons taco seasoning until no longer pink; drain. 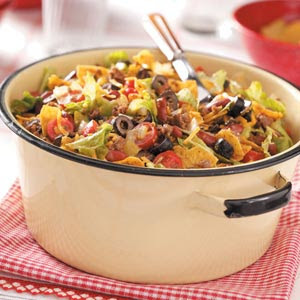 In a very large serving bowl, combine lettuce, chips, tomatoes, kidney beans, olives, cheese, onion, chilies & beef mixture. Combine the dressing, salsa, remaining taco seasoning & sugar seperately. Pour over salad & toss to coat. Serve immediately. This sounds yummy too! You always post such great recipes! THanks! Next time I'm feeling Mexican-ish, this is gonna be on the menu! I love Taste of Home magazines, they have awesome recipes- thanks for sharing this one!